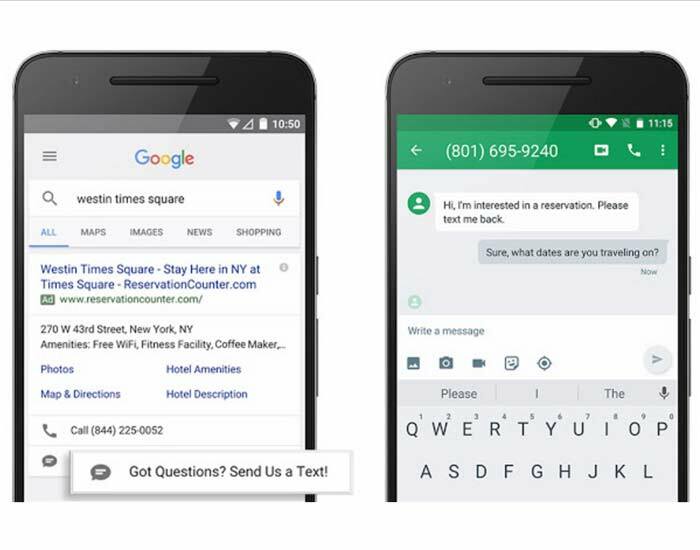 Google has recently rolled out the click-to-text message ad extension in Google AdWords. The feature is automatically available to all customers and like call-only ads, it’s available only on mobile. The steps are simple to set up your Text Messaging Ads and you will be charged for text messages at the same CPC that a call or click costs you. The biggest difference between serving call-only ads and text message ads is that you can schedule the days and times throughout the day that your text messaging ads show. 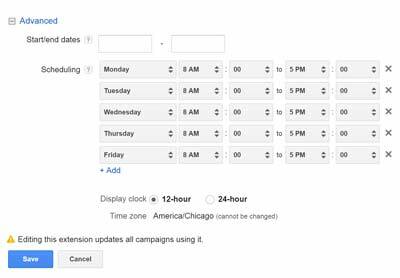 If your office closes from noon to 1:00 each day or early on Friday the ad schedule can be adjusted. If you like getting calls from prospective clients, start receiving text messages by following these steps. 1. 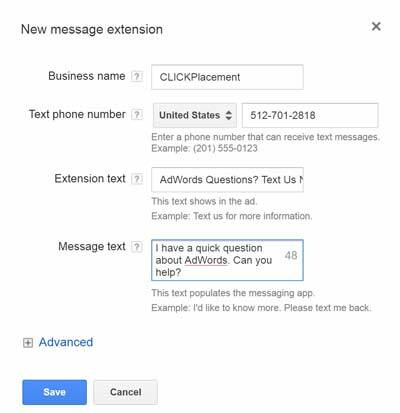 Go to your campaign and click on the ‘Ad extensions’ tab and from the View drop down choose ‘Message extensions’. 2. Since you have not added Message extensions yet, click on the ‘+Extensions’ red button. 3. Click the new message extension and the window will popup up where you will create your text message ad. The first field is your Business Name followed by your phone number that MUST be able to receive a text message. A mobile device or a Google number both work great, just choose a number that will be monitored during the hours when the text messaging ads will show. 4. The extension text field should be a call to action and encourage people to send you a text message. You can use up to 35 characters including spaces. 5. The next field is the Message text field that will appear when someone taps to send you a message, the message text will pre-populate in their messaging app. 6. Click on the Advanced link and choose the days and times that you want your text message ads to show. 7. Click Save and your new text messaging ad is live. Don’t forget to create more than one ad to A/B test your ads and see what your prospective clients react to the most. 8. When your ads begin to show activity, remember that you pay each time a person clicks on your text message ad. The messaging app will load in their phone and then they can text you. If they bail out from this window on their phone, you will still pay for that click. 9. Check your statistics frequently by returning to this page and see how many times your ads are shown, clicked on and converted customers. 10. Want to save time and have us set up your Text Messaging Ads? Send CLICKPlacement a text to 512-701-2818. CLICKPlacement is a digital marketing agency specializing in par-per-click marketing strategies designed to generate sales and leads, build brand awareness, sell products or generate mobile app downloads. This entry was posted in Paid Search Marketing and tagged Google Adwords, PPC Marketing, Text Messaging Ads.